​​The main ingredient in OraCare is Activated Chlorine Dioxide (CLO2). It was discovered in 1814 by Sir Humphrey Davy and was actually first used as a bleach. In fact, even today it is used for bleaching wood pulp, because it is such a great oxidizing agent! This is also why it is exceptional at helping to maintain white teeth. We have also seen this product used for a variety of antimicrobial uses, including in mold clean up after hurricane Katrina, and in water treatment systems due to its effectiveness at breaking up biofilm. 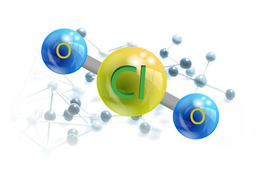 Chlorine Dioxide is a neutral compound that is effective even at low concentrations because of its unique qualities. It very different from elementary chlorine, both in its chemical structure as well as in its behavior. One of the most important properties to be aware of about CLO2 is that it is a gas. To make CLO2, two liquids must be mixed to allow the gas to be released, this also contributes to the importance of a two bottle system. As a gas Activated Chlorine Dioxide is able to permeate places where liquids and solids just can’t go.